Malaysian street food is internationally acclaimed but sometimes sitting out in an open air can pose a problem for some. Onde Onde, Flavours of Malaysia, however, is bringing these world famous dishes to its restaurant for a cosy dining experience. An All-In-One place where you gets to taste and savour the good old Malay kampung dishes as well as Chinese and Indian favourites under one roof. Onde Onde aims to bring back a sense of nostalgia with each dining experience at their restaurant, placing emphasis on delivering great taste and good food to its diners. Onde Onde believes that when serving local food to the Malaysian public, one has to deliver results, by surpassing consumer expectations, as Malaysians know their food well. I love the perfect setting of a warung or hawker stall smack right in the vicinty of the restaurant, how nostalgic ... just like eating from the road side stalls. Amongst Onde Onde’s best sellers, are its Assam Laksa, Nasi Lemak Istimewa Supreme and Prawn noodles (‘MeeYok’) which are family recipes passed down generations to retain its authenticity. Colourful and detectable, Onde Onde boasts of over 25 varieties of authentic ‘kuih-muihs’ to select from as a tea time snack or as dessert after each meal. Decorated with nostalgic items of the past with old fashioned tiffins, pots and glass containers which are specifically sourced afar and hand-picked, to create a memorable dining experience. To start off my dinner, I opt for a glass of Ice blended Watermelon with Lychee. Didn't really enjoyed it as it's too sweet for me. I can't taste the fresh watermelon juice as the lychee is blended and mixed together, so overpowered with the lychee instead. Wrong choice of drink! Anyway, you can take your picks from the wide selections of drinks available starting from the Ice Blended drinks, Speciality drinks, Sparkling Fruit coolers, Fresh Pure Juices to the traditional hot Kopi-O, Teh-O-Limau, Teh Halia to Cold Barley, Sirap Limau and even a special Kopi Santan! For starter, we choose to have some Pandan Chicken, which is yours truly favourite food of all-time. Well marinated with lots of fresh herbs and spices, flavourful but the setback is that Onde Onde does not serves the chicken meat as is it, but instead they minced the chicken meat and marinated it with spices and herbs, shaped them into chunky pieces and have it wrapped with pandan leaves before frying. Taste wise is still acceptable but I would still prefer to eat some real tender and juicy chicken meat with bones or even boneless. The best part to eat for real good pandan chicken is the chicken thigh where it's succulent, tender and some chewy part to bite into. Anyway, this is my 1st experience eating a minced chicken meat - Pandan Chicken. I guess this is only good for kiddies and elders as there are no bones to chew on. If you are a fan of the real authentic Pandan Chicken, so save your tummy and money to eat it at a Thai restaurant next time! Next we have some Otak-otak. They come served in huge chunky pieces, real generous serving of 6 pieces of cut bite size otak-otak. Totally different from the regulars ones we used to eat at Muar - the really flat wrapped in banana leaves ones, selling from 80 cents to Rm 1.50 per piece. Good stuff, taste good and real value for money too but don't set your benchmark against the Best in Muar or Johor, okay! Duck Egg Char Kuey Teow is our 1st choice as it's highly recommended by their manager. Onde Onde's Signature dish, I must try this ... so to say. What makes Onde Onde's version so different and special is that they stir fried the flat noodles (kuey teow) with duck eggs together with crunchy bean sprouts (taugeh), chinese chives, fresh prawns and lots of chicken too. I enjoyed eating this tasty fried noodles as serving portion is good and they are generous with the taugeh and chicken too. Next, I choose to have Malaysian oh-so-famous even the foreigners know of it dish ~ the ubiquitous Nasi Lemak. An all-time-favourite in my family, I can practically eat this sinful dish everyday! Onde Onde Nasi Lemak Special or Istimewa Supreme servings comes with their Signature Ayam Goreng Berempah, Sambal Prawn, Otak-otak together with other condiments of keropok, boiled egg, peanuts and fried anchovies (ikan bilis). An impressive dish with the juicy and flavoursome, well-marinated big and juicy chicken drumstick which is very delicious. Prawns in the sambal are fresh, best eaten with the fragrant nasi lemak. Prawn sambal is so good that I practically finished the rice with this prawn sambal instead of the nasi lemak's sambal that comes with this set. A Must-Try for any nasi lemak lovers! Our next try is this Belacan Fried Rice, Malaysian classic rice dish. Served with lots of fried egg, shredded lettuce, papadom and stewed turnip and carrots (Jiu Hoo-Char). Not oily, wok-fried with chilli and spices and a hint of belacan only. This fried rice dish is acceptable and I'm surprised to know that Onde Onde have a Chinese chef helming the kitchen that night. No wonder-lah my rice tasted 'Chinese-style with the wok-hei'! This tangy and spicy noodles dish served in a mackerel-based tamarind broth topped with shredded pineapple, mint leaves, onion, chillies, cucumber, ginger flower and prawn paste (haeko) for added flavour. Serving size is generous and taste wise is just average for me. Having tasted better ones than this, I'm expecting a more kick ~ robust, fragrant and stronger sourish taste out of the asam laksa broth. You can still try their popular signature asam laksa dish as they are rated among the top in Klang Valley in the New Straits Times (NST) most recently (Feb 2014). As I have said taste wise can be very subjective, maybe you can be the judge for yourself and set your bench mark against this highly rated dish in Onde Onde. Wrapping up the meal is none other than Signature Durian Dessert , a dessert synonymous with Penang cuisine. A must try for durian lovers as it's simply heavenly. An unforgettable dessert of cendol with shaved ice topped with dreamy durian drizzle with sweet savoury gula melaka. Durian lovers are in for a real treat with this awesome dessert of durian. Nothing less than of a heavenly taste of the creamy durian, Without a doubt, my favourite dessert of the night! 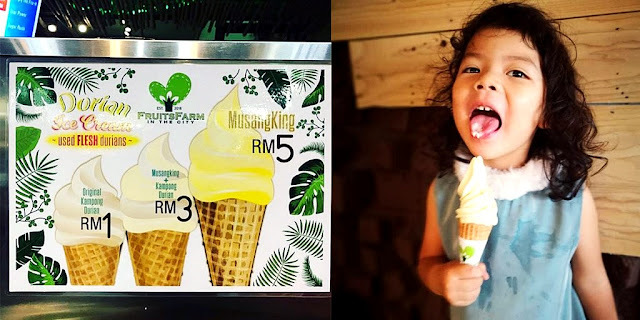 If you still have room, there are more desserts like Cendol, ABC Gula Melaka, Sago Gula Melaka and Golden Banana fritters with ice cream for you to savour. My hubby ordered this unique coffee drink out of curiosity. He can't imagine how it's going to taste like ~ coffee with coconut milk. Anyway, this drink didn't make it to his favourite list, citied it's too sweet with a strong santan flavour. I think he should just stick back to his cappuccino or Kopi-O instead. Onde Onde fares quite well overall with a wide choice of local favourites in the menu. Although there maybe some hits and misses in some of their dishes, Onde Onde is still a good place to eat for some decent Malaysian food and not overly priced menu. Check out the menu here : ONDE ONDE Menu to decide for yourself. Diners are definitely spoilt for choice with their variant local favourites, great place to go with your touristy friends or foreigners wanting to try everything out of our Malaysia street food at this One-Stop Restaurant serving Flavours of Malaysia! 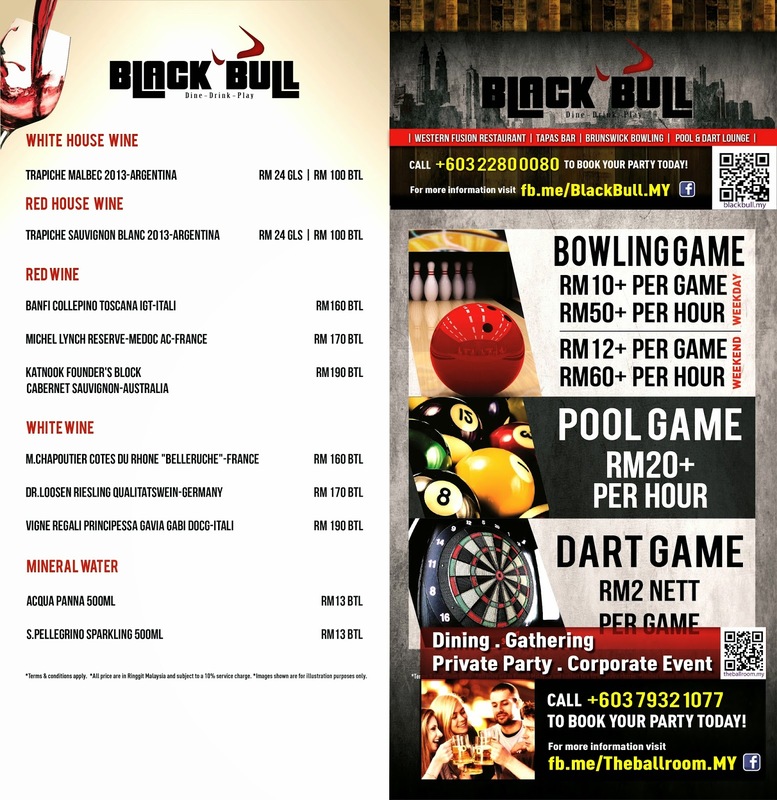 Black Bull [Dine – Drink – Play] is significant as the First Bowling Themed Dining Venue of its kind in Malaysia. After the first flagship outlet at KL, Black Bull is proud to present the new Black Bull outlet at 3rd floor, Mid Valley Megamall. Black Bull concept of Dine, Drink, Play is exclusively designed for maximum enjoyment altogether. The outlet itself is a combination of western fusion restaurant, full service tapas bar, together with Brunswick luxurious bowling lanes, pool tables, darts machines and KTV rooms. 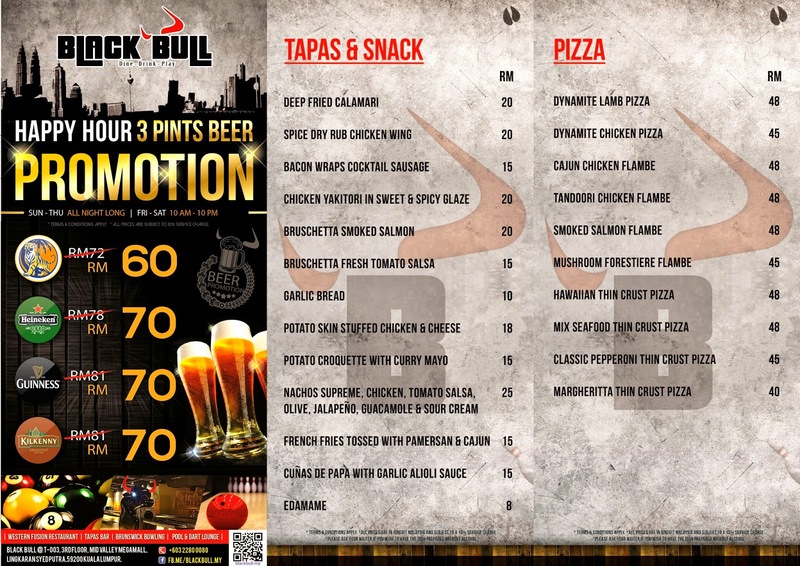 Black Bull is definitely a perfect place for gatherings, private parties and corporate events. Black Bull all-day-dining restaurant offers a comfortable, spacious and contemporary dining space for you and your friends to dine in. They serves a variety of Western and Local favourites to suit your palette. Diners will be spoilt for choice with the chicken chop, fish & chips, nasi lemak, pasta or 10 types of pizzas to choose from. 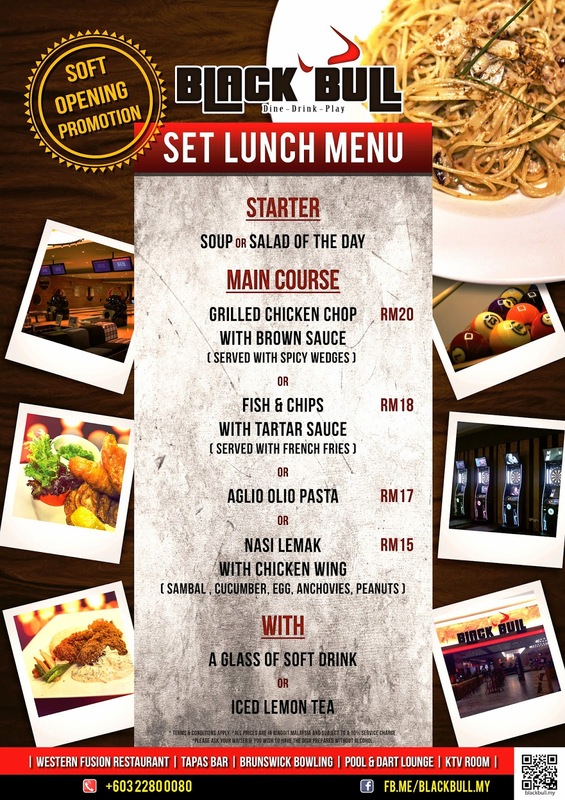 Set Lunch is from as low as RM15+ onwards with choice of Main Course of either Grilled Chicken, Fish & Chips, Pasta , Nasi lemak which comes with free soup or salad and free iced lemon tea or soft drink. That's really value for money. Not forgetting the full wine list for diners to wine and dine with their loved ones. You can also check out the prices for bowling, pool and dart game charged per game or per hour in Black Bull. Exclusive neon lightings table top and comfy sofas at the bowling alleys for everyone to chill and relax during the games. Black Bull offers great ambience and elegant furnishing, a multifaceted concept with stylish interior for its guest to dine, drink and play as well. besides that, Black Bull does caters for any social or corporate events, birthdays parties, gathering or any other special celebration. Experience an enjoyable and fun karaoke sessions as you mingle and sing away your blues with your family or friends in this brand new KTV rooms at Black Bull. Last but not least , here's another popular joint for the young and trendy to play some pool or dart games at exclusive Black Bull. Overall, Black Bull is a total indulgence for those looking for a great place to unwind and relax over a game of pool, dart, bowling or even some KTV sessions. They offers a cozy and warm ambience in outer bar and dining area, exclusively awesome environment in inner lounge together with all mouth-watering foods, impressive cocktail list, premium entertainments and lively music. It will be a whole new dining experience for everyone. Do check this brand new place out, I'm sure you will be impress .... just like me and my friends too!